It’s early in a long day. Mark and I are off to watch our football team, Grimsby Town, in their last hurrah before relegation out of the Football League. At the other end of our carriage on the train, a dozen or so other Town fans, who look about sixteen years old, are singing and stamping their feet. Other passengers chuckle indulgently. We chat to some supporters standing by us, who are closer to our age, and to a couple of men with Sheffield accents. Of the estimated 2,500 Grimbarians making the journey today, perhaps 60 or 70 leave the train with us when we step off. Most of these are the young, boisterous singing types. They turn left and make for the town centre townie bars. Mark and I turn right. Around us are a dozen or so other Grimsby fans who look like they’ve spent some time this week doing the same thing we have: homework on the pubs of Burton-on-Trent. The Devonshire Arms is supposed to be open, but isn’t. So we continue round the corner to the Coopers Tavern. Or rather to a sign on the street saying the Coopers Tavern is somewhere down this dark alley. We nudge hesitantly along it, unsure whether we’re approaching a pub or about to trespass into an innocent back garden. Finally there are doors, closed and mostly unmarked. 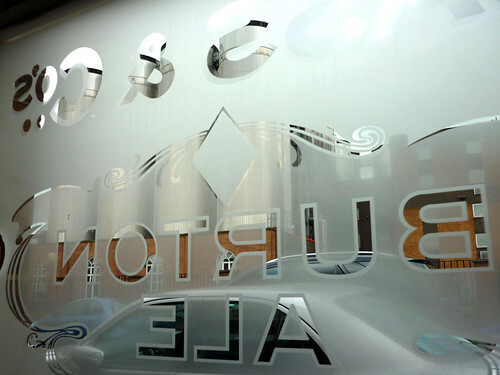 I push on the likeliest: to our inexpressible relief, it opens into a pub and not an unsuspecting Burtonian’s kitchen. We take two or three steps inside, and then stop. To our left, a homely room with a tiled floor, very unpretentious décor, and more doors leading off. 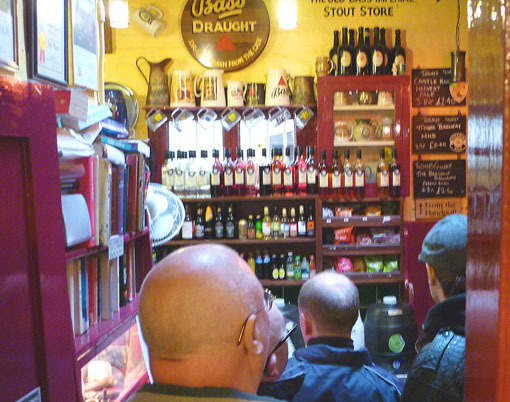 To our right, a narrow passageway down to a bar room crammed with all sorts: bottles racked up high, snacks stacked up high, beer from the pump, beer from the barrel, barrels to sit round, stools to perch on, award certificates and a bookcase on the wall. Remember the old text adventure games where you had to type in commands like UNLOCK DOOR and GET SWORD? This feels like the moment in one of those games where you’ve solved a problem and reached a new area of the gameworld and you can’t quite decide which of the myriad new places and possibilities you want to explore first. The dozen or so Grimsby fans who came our way off the train follow us in and form a tight queue down to the bar. We come away with the pints and along the homely room. A door leads off it to the street and another to a snug. Expecting a few mates to join us later, we bagsy the snug and settle right in. It’s got the same tiled floors, wooden tables and stools as the rest of the pub, with ornamental mirrors, a fireplace, pretty cushions and brewery paraphernalia on the walls. We release a fusillade of text messages informing our friends and fellow fans where they’ll find us when they arrive in an hour or so’s time. They’ll find us, we add overexcitedly to the texts, in the best pub in the world. 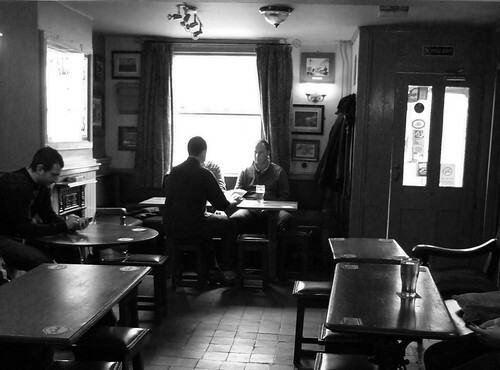 Over the hours and pints that follow, the Coopers attracts a few more drinkers. Most are off to the football. At its peak, the pub attendance probably passes 30. None of these include our friends, who are variously holed up in a pub nearer the football ground, going for something to eat, and too late arriving in town to come and find us. With marvellous serendipity, though, we are joined at the next table by the two Sheffielders who were on our train. They are, it turns out, Wednesday fans, whose season ended last week, but they chose a random game to attend as neutrals and take in some ale. The poor chaps endured a spell in the Lloyds over in the town centre, but they’re here now. What can we do but spend the next couple of hours in excellent conversation with them about Sheffield, pubs and the football? Oh, wait. There’s the bit where I go off to the toilet and come back and one of them is knocking out tunes on a scuffed piano leaning against the wall of the pub, and a bunch of drinkers are circled around it, clapping and cheering him on. At last it’s time to start the long, straight walk out to the stadium. My friend Dan, who comes from round these parts, told me yesterday that the Coopers is “quite simply brilliant”. This is misleading, really. It’s better than that. And we’ll come back sometime without the football to spoil a day. One slightly ropey pint aside, this place is pub paradise; alehouse Arcadia. It’s all your pub dreams come true. It makes Orwell’s Moon Under Water look like Friday night at Wetherspoons in Dunstable. Sorry to hear that, chum. Hope you’re well again now. Let us know if you make it down there later and fancy breaking up the journey at the Sheffield Tap. It really is no exaggeration to label this the best pub in the world. If you don’t think it is you’ve either been to a bloody good pub somewhere I’ve never been, or you don’t really like pubs. When the Chatsworth family didn’t like the view from their huge house being spoiled by a nearby village, they uprooted it brick by brick and re-built it further away out of sight. I wish I could do that with the Enterprise Inns pub at the top of my road, but swap it with Coopers Tavern. I could then sell my house, and move in to the pub. And they play hosts to a very discerning bunch of Folkies who gather to play a music session. Unfortunately my informant did not tell me which night and I think it is monthly. But real ale pubs are where you find these accomplished musicians.